The program is determined by the Planning Committee and conference chairs. The Full Program is available part way down this page. Many presenters have shared their powerpoints, which are linked as PDFs below the presentations. Available presentations comes from Adkins, Bao, Carla squared, Curtis, Dirks, Dorner, Inzunza, Mohammed, Pope, and Sierk - thank you! The printed program is available in PDF format. 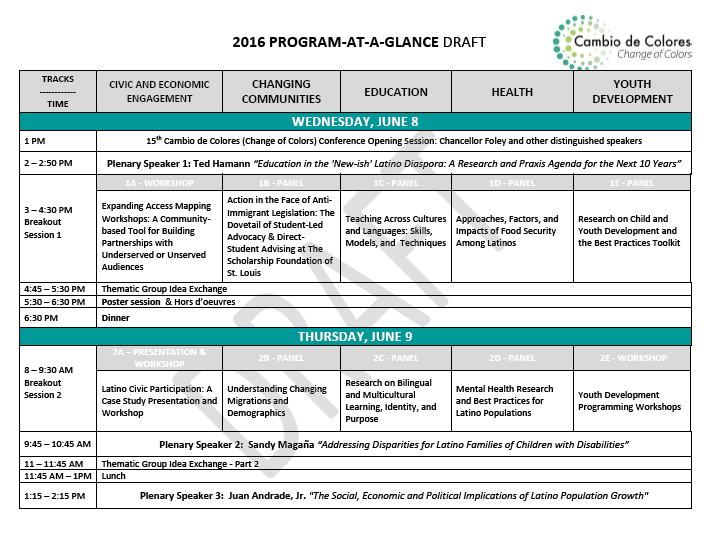 See the Program-at-a-Glance here. Details on pre-meetings here. We are overjoyed to have four outstanding plenary speakers this year. Learn more about 2016 Plenary Speakers at the speakers page. This is the program for the conference and is subject to change. To better visualize the schedule, please see the Program-at-a-Glance. Any changes from the printed program will be marked here with yellow highlight. Pre-Meeting details are at the bottom of this page. "Current Research Examining Latino/a Children and Youth Well-Being"
"Social Cognitive Predictors of Well-Being and Mental Health among White and Latino/a Engineering Students: Gender and Ethnic Group Model Comparisons"
See the plenary video on youtube. "Meet Them Where They Are and Take Them Far: A Holistic Approach in Youth Development for Hispanic Families"
"Cena y Ciencias: Science Programming in Spanish and with Parents"
Presenter list has been updated. Annual Meeting of the interstate initiative Latinos and Immigrants in Midwestern Communities (NCERA 216). Among NCERA 216's activities are webinars that it hosts throughout the year, which can be viewed here. The interstate initiative Latinos and Immigrants in Midwestern Communities (NCERA 216) brings scholars, practitioners and community leaders into a research and education network to make achievements in the following areas: 1) Entrepreneurs and Business, 2) Families and Education, 3) Building Immigrant-Friendly Communities, 4) Building Diverse-Competent Organizations, and 5) Demographic Change. The initiative promotes inter-university and inter-state research collaboration in communities and the design and implementation of interventions that can lead to best practices in each of these areas. The Midwestern states included in the initiative are: Kansas, Illinois, Indiana, Iowa, Michigan, Minnesota, Missouri, Nebraska, North Dakota, Ohio, South Dakota and Wisconsin. MODLAN will gather from 11 am-1 pm before the conference begins on Wednesday, June 8, 2016. At this meeting, we will discuss our growth over the past year, revisit our goals and purpose, and make plans for future professional development and coursework on DL education needed across the state of Missouri. Please join us! Contact Dr. Lisa Dorner to RSVP: dornerl@missouri.edu. Students will gather to network, organize, and discuss building collaboration across universities on themes relevant to Cambio de Colores and their related research. Breakout sessions will each have options within five tracks.